NEW YORK, NY (June 14, 2011) – On Tuesday afternoon in New York City, WBC Middleweight Diamond Champion and universally recognized top-3 pound for pound fighter, Sergio “Maravilla” Martinez (47-2-2, 26 KOs), signed a new multi-year, multi-million dollar deal that will keep his promotional interest with DiBella Entertainment (“DBE”) for the foreseeable future. Martinez, 36, originally linked up with DBE in 2007, and has gone 7-1-1 over the span. The only blemishes on his record during that time were a close decision loss to Paul Williams in a fight widely heralded as the 2009 Fight of the Year, and a universally criticized draw versus former champion Kermit Cintron in 2009, a bout where most people thought Martinez should’ve been awarded a knockout in round seven, and also did more than enough to win after 12 rounds. 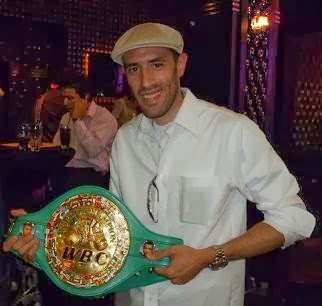 After a victory over Kelly Pavlik to win the middleweight crown in April 2010, and a stirring second round knockout to avenge his loss to Williams in November, Martinez was named the 2010 Fighter of the Year. Martinez began 2011 in a big way in March, stopping previously unbeaten Sergiy Dzinziruk in eight rounds. Also in attendance at the signing, which took place at a local stationary store just a few blocks from DBE’s mid-town headquarters, was Martinez’ longtime adviser, Sampson Lewkowicz. “This is about finishing what we started,” said Lewkowicz. “I believe that in Sergio Martinez we have a grand champion who is the best fighter in the world." Martinez is scheduled to return to the ring October 1 on HBO against European middleweight champion Darren Barker (23-0, 14 KOs).